According to Spotrac.com, the New York Giants currently have approximately $6,237,530 in salary cap space, not counting the estimated $9,794,270 the Giants will need to sign their 2018 draft class. Only the top 51 player salaries for a team count against the salary cap in the offseason. 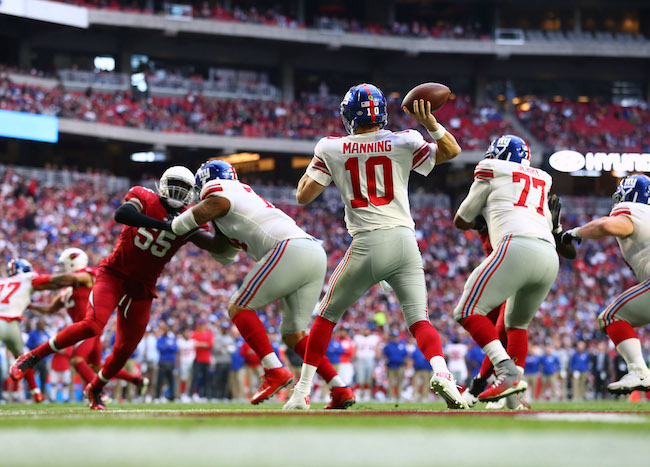 (Note: NFL Player Association records say the Giants have $5,045,156 in salary cap room). According to Spotrac.com, the New York Giants currently have approximately $9,588,285 in salary cap space, not counting the roughly $4,081,274 the Giants will need to sign their 2017 draft class. Only the top 51 player salaries for a team count against the salary cap in the offseason. 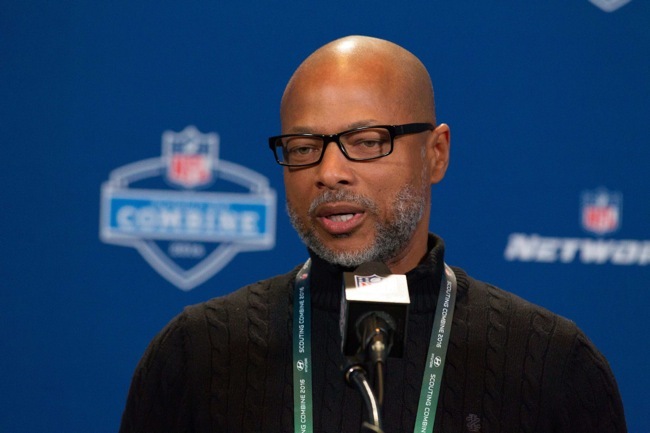 (Note: NFL Player Association records say the Giants have $9,483,626 in salary cap room). According to Spotrac.com, the New York Giants currently have approximately $17,855,970 in salary cap space with 91 players (one on Injured Reserve – linebacker Uani ‘Unga) currently under contract. 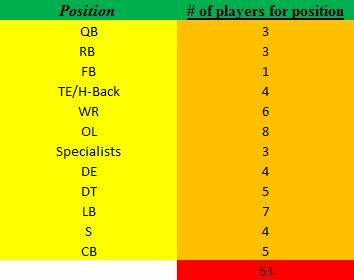 Only the top 51 player salaries for a team count against the salary cap in the offseason. 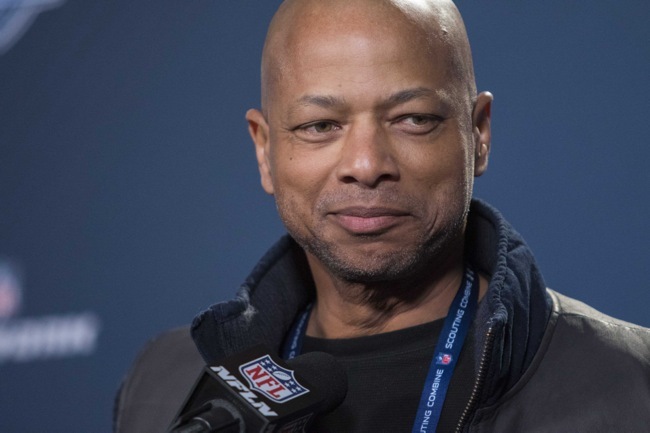 (Note: NFL Player Association records say the Giants have $18,160,235 in salary cap room, including two players on Injured Reserve – linebacker Uani ‘Unga and wide receiver Ben Edwards). According to Spotrac.com, the New York Giants currently have approximately $24.67 million in salary cap space with 64 players currently under contract. Only the top 51 player salaries for a team count against the salary cap in the offseason. According to Spotrac.com, the New York Giants currently have approximately $58 million in salary cap space with 50 players currently under contract. Only the top 51 player salaries for a team count against the salary cap in the offseason. 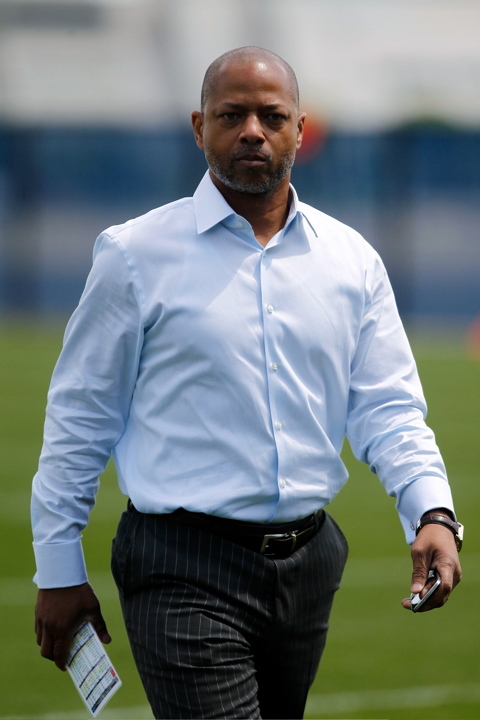 According to Spotrac.com, the New York Giants currently have approximately $10.879 million in salary cap space. This assumes that defensive end Jason Pierre-Paul signs his $14.813 million Franchise tender and does not agree to a longer-term deal that reduces his immediate cap hit. These numbers include the recent releases of running backs David Wilson and Peyton Hillis, defensive end Mathias Kiwanuka, and center J.D. Walton. The only new additions to the list are WR Julian Talley (just activated off of the Practice Squad), and RB Kendall Gaskins (just signed to the Practice Squad). 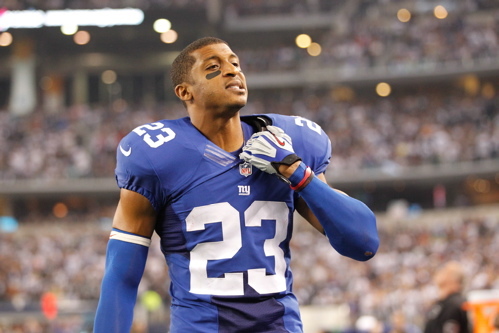 CB Corey Webster’s cap number will remain the same, with him simply going from the 53-man roster to Injured Reserve. These cap figures are courtesy of the Giants’ Team Salary Cap page from OverTheCap.com run by Jason Fitzgerald (he can be followed on Twitter @Jason_OTC). The only player that he and I differed on cap number-wise is DT Markus Kuhn, who spent a large chunk of time this season on the PUP List. I then noticed a mistake that I made in calculating Kuhn’s cap number. I wrote about it on my Giants cap blog (click HERE to read about it towards the bottom of the post). I mistakenly listed Kuhn’s cap number in the table above as being $418,591. It should be $429,003. the players on the 53-man roster. 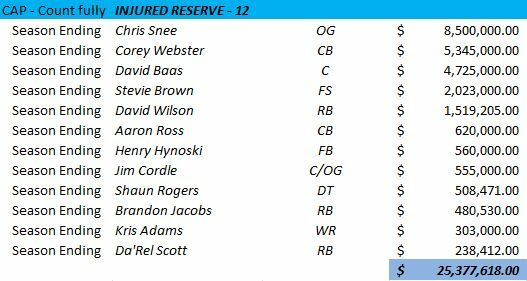 the 12 players currently on Injured Reserve. the players on the 8-man Practice Squad. The only one whose cap number isn’t the same as his salary in this category is OG Eric Herman. Herman was drafted by the Giants this year in the 7th round, and received a signing bonus before being cut, clearing waivers, and then being re-signed by the Giants again as a member of their Practice Squad. As per the NFLPA’s League Cap Report website, the Giants are $41,888 under the salary cap. They placed Corey Webster on I.R. two days ago, and promoted WR Julian Talley to the 53-man roster from their Practice Squad, followed by signing RB Kendall Gaskins to fill the Practice Squad vacancy created by the promotion of Talley. Talley’s cap number is $47,647. The Giants’ cap number prior to these three roster moves was $89,535 – also last in the league. The Giants can’t make any other roster moves this week without having to be forced to restructure a player contract in order to stay under the cap. As long as nothing freakish happens in practice injury-wise, and they get out of Detroit game reasonably unscathed, they’ll make it through the season without having to tweak a contract in order to make it through the last two weeks of the season. They’ll be able to I.R. someone next week (just 1) since the prorated cost to sign a player will decrease compared to this week. 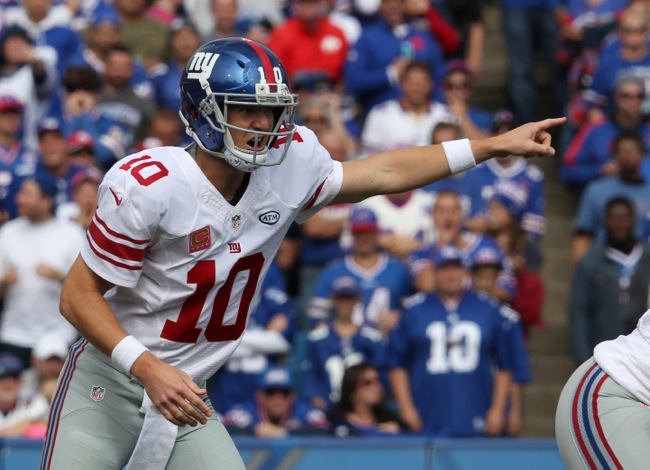 If Detroit lays a physical beating on the Giants, then things could get ugly. As can be seen above, the Giants are $251,536 under the cap. They are ranked 31st in the league in available salary cap space. Only the St. Louis Rams have less room under the cap now than the Giants do with $103,482 in available cap dollars. As I usually state, these figures are the closest that we can possibly know of publicly since the NFL Management Council is the only body that is truly 100% accurate. Those numbers are very difficult to get a hold of, as Jason Fitzgerald from OverTheCap.com has said over the past summer. The figures that the NFLPA shares on it’s public website are sometimes subject to data entry errors, and slow processing of actual numbers that have already been put in with the league itself. For our purposes though, they are sufficient (knowing where teams stand in proximity to each other as well as themselves in the recent past). Incredibly enough, we’re coming up on week 12. There are only five weeks remaining in the regular season after this week’s upcoming games. With the season being approximately two thirds of the way over, the Giants have enough room to barely skate by. If they have a rash of injuries that forces them to place three or more players on Injured Reserve in the next two weeks, then they’ll have to make some more room under the cap. Hopefully that doesn’t happen. Teams don’t give out bonuses to anyone at this point that they’re bringing in off the street, or off of waivers after they’ve cleared it (a la Ed Reed and the Jets last week). 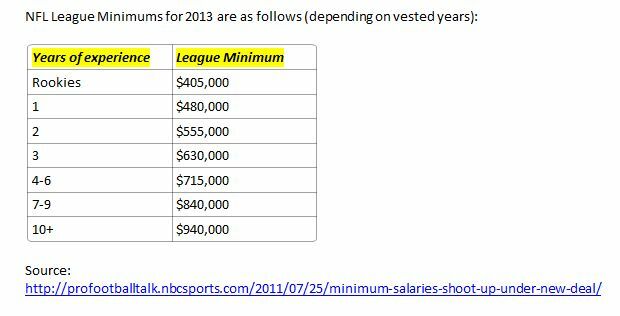 If they happened to give a player a signing bonus of more than $65,000 then the MSB designation goes away. That’s not happening until the off-season, but it’s something to keep in mind as a general matter of fact regarding caponomics in the NFL. As transactions occur in-season, they almost always only are paragraph salary transactions, and usually involve players with less than 4 accrued season. Jacobs would have less incentive than usual to use his one-time only claim to termination pay if the Giants waive him for some reason in the coming weeks (doubtful since he’d sooner wind up in I.R. first, and because he has a salary split in his contract). The Giants would probably go to a player that is on the cheaper side of the options they have open to them if push actually came to shove. This is part of the reason that you see Practice Squad players being lured to sign on with other teams in-season, joining their 53-man rosters. This is why the Packers paid QB Scott Tolzien as if he was a member of their 53-man roster when he was on their Practice Squad. The Packers promoted him to their 53-man roster on November 5th, as per this article from two weeks ago on NFL.com. As indicated in that article, Green Bay also increased Tolzien’s salary from the Practice Squad minimum of $6,000 per week to a base salary of player on the 53-man roster – $544,999 to be exact. This was done so as to make sure that he would not be tempted to sign elsewhere. 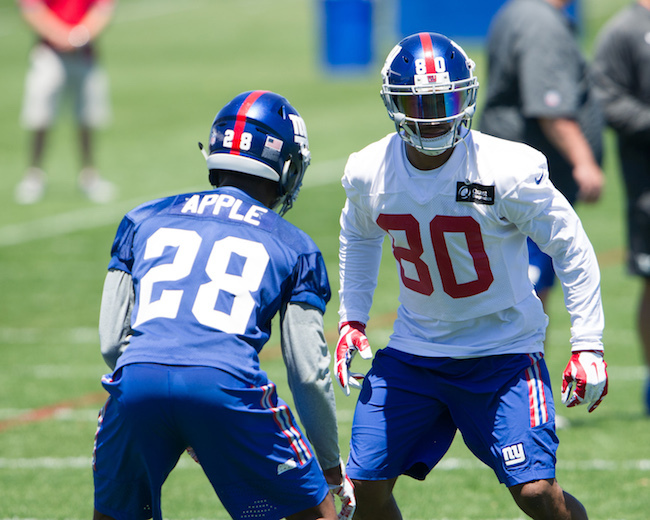 If any more moves are made, they may very well be made with the Giants’ pro personnel department looking at players who stand out on other teams first before bringing in a “name player” to fill a hole. Let’s hope that the injury bug has taken a little vacation for this club for a while as they continue to try and climb back into the NFC East race. Three Ways of Dealing with David Baas’s Contract: I’ve seen people ask me questions here on The Corner Forum about Center David Baas’s contract, and it’s impact on the team going forward. His contractual breakdown is pictured above, courtesy of Baas’s salary cap page from overthecap.com. Let me point out the three most likely ways how his contract can be dealt with (meaning ’86ed). Baas has two years left on his deal after this season. He restructured this past off-season, moving dead money further down into his last two years, making it more difficult to cut him. One way that the Giants could deal with his situation is to cut him after this season, and gain $1,775,000 in cap space this off-season. The second course of action that they can take is to wait until after 2014 to cut him, when they could gain significantly more cap space – $5,250,000 to be exact – and have less dead money on the books as well ($3,225,000 compared to exactly double that amount if the Giants cut him after this year). This brings me to the third option…(somehow Heisenberg’s voice during his conversation with Gustavo Fring from Breaking Bad out in the desert is rattling around in my head as I type this). If Baas continues to be a liability by not being able to stay healthy, or play well when healthy, then they might have to go with the first option – something which is becoming increasingly apparent. A third way that they could do this AND gain MORE THAN $1,775,000 in cap space would be by releasing him this off-season and designating him as a post-June 1st cut. Teams can do this with up to two players a year. The Dolphins did this with two of their own this past off-season when they designated Linebackers Kevin Burnett and Karlos Dansby as such; you can read about it by clicking HERE. Teams that use this strategy won’t reap the cap benefits right away though. They have to wait until June 2nd to do so; however, the players who are released under this designation are free to sign elsewhere as free agency starts when more money is available, and teams are ready to flex their wallets, so to speak. This is advantageous to the player in that it gives them a much better opportunity to find a job elsewhere at a higher salary, instead of waiting until after June 1st when teams have shot their collective wads. As of June 2nd, the team can then gain room from not only the regular cap savings (which after 2013 in Baas’s case would be $1,775,000), but they’d also be able to spread out the remaining dead money – provided the player has at least 2 years left on his deal and has not completed his 4th year with the club (as per the present CBA, NFL contracts can’t be prorated more than 5 years). If the Giants were to exercise this option with Baas this coming off-season, they’d be able to split up his Dead Money over the course of two seasons – 2014 and 2015. That Dead Money amount, if he were to be released this off-season would be $6,450,000. The Giants would be able to evenly spread this amount out over those two years of 2014 and 2015. They would also GAIN an extra $3,225,000 in cap space in addition to the regular amount of cap savings mentioned above ($1,775,000) if they were to release him under normal non-post-June 1st standards. Their cap savings in this case would be $5,000,000 in 2014 with only $3,225,000 in Dead Money remaining on the books for 2014 – half the original amount. The other $3,225,000 will be added to the 2015 season’s Dead Money total. This third option that I described in detail above will be seriously considered after the season, as the Giants evaluate Baas’s future on the team. Suffice it to say, due to a combination of his injuries and consequent sub-par performance in comparison to this contract, he won’t be here past 2014 at the LATEST. Hell, he’ll be lucky to be here next year the way things are going. To wrap this up, and paraphrase Heisenberg in the process, let me go on record as saying that as of this moment, I prefer option 3.